After 2 weeks of fermentation, 5 days of dry hopping, and 2 months of keg conditioning, the Farmhouse IPA is tasting great. Beginning in late spring with the onset of hot Texas weather, I was inspired to make a hop-forward saison-like beer for the summertime. Detailed in the brew day post, anticipating ultra-high attenuation of Wyeast French Saison, I designed a malt-forward grist to balance out the bitterness and late-hop character of the finished brew. Overall, the Farmhouse IPA has loads of character and with 100+ F Texas weather already here, a nice refreshing summer brew. A review and recipe below. Cheers, and happy brewing! 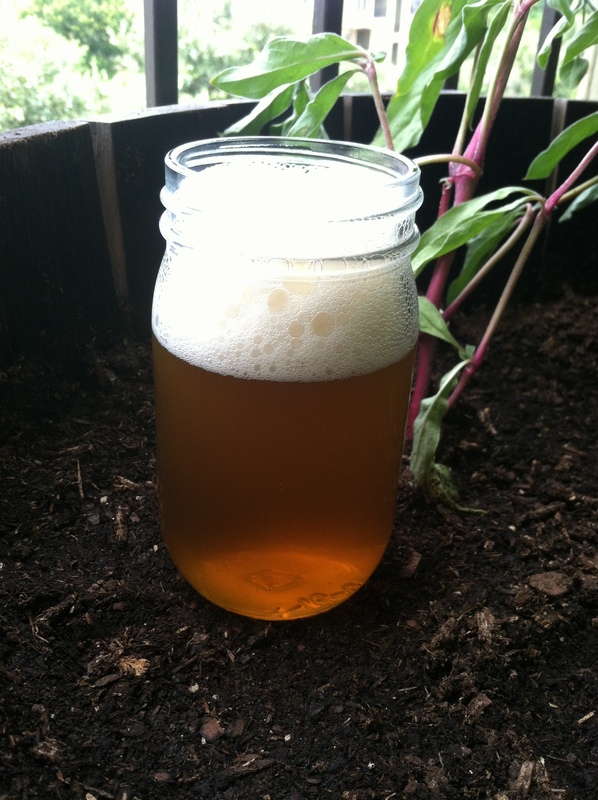 Pouring into a mason jar, the Farmhouse IPA has a hazy, orange appearance with pillow-y head. The aroma is harmonious between the multitude of Saaz hops and fragrant French saison aroma, best characterized as floral and herbal supported by tones of pepper and hop grassiness. In tasting, the aroma is strictly separate from the flavor, dominate of earthy/herbal hops with balancing notes of toasted bread. When the beer warmed, a light note of lemon and citrus became apparent. As expected, the bitterness is moderate, enhanced by very low residual sweetness. On the palette, the beer finishes crisp and clean, further perceived by medium-high carbonation and gypsum-forward water profile. At ~5.5% ABV, this beer feels smaller than it is, and as a result, very sessionable. Best summarized as rustic, this beer satisfies both as a farmhouse ale and hop bomb, and is best had with warm weather, something Texas has plenty of during the summertime months. This recipe was initially inspired by Hoppy French Saison by Michael Tonsmeire of the Mad Fermentationist blog. Using his basic idea, Saaz hops would comprise the late hop character for the brew while pairing well with the fermentation characteristics of the French saison yeast strain. However, diverging in malt character, the grists were significantly different, as detailed in brew day post. Essentially, since the French Saison yeast is hyper-attenuative, I engineered a grist that would leave enough malt character after fermentation to support the late hop additions. From the tasting notes, I would say it was successful, as a noticeable toast character was apparent, and complemented the saison yeast and Saaz hop character. 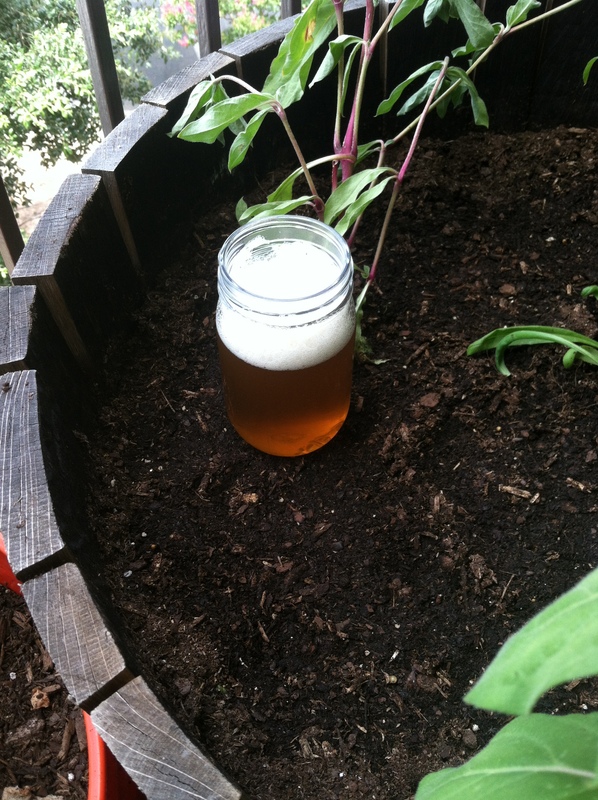 For a future re-brew, there would be a few things I would like to play within the Farmhouse IPA recipe. I would definitely try the Wyeast Belgian Saison yeast strain while keeping the grist the same. I prefer this yeast strain in saisons; however, its general trickiness can dissuade. I think the Belgian saison yeast character would be fantastic with Saaz or Hallertau hops. Also from the tasting notes, I think this recipe can handle a few more IBUs. At 35, technically below IPA levels, the preception on palete is much bigger enhaced by medium-high carbonation, gypsum-forward water (6:1 sulfate:chloride ratio), and low attenuation. Even still, I think you could push this recipe to the 40-50 IBU range without muting the overall malt character. Perhaps next spring/summer, when my saison craving is at its highest, I’ll try both. Have you brewed a hoppy saison or farmhouse-style IPA? Leave your experiences in the comment section below. Cheers, and happy brewing!